-- Select a Size/Color -- X-Small Small Medium Large X-Large 2X-Large 3X-Large - Out of Stock! 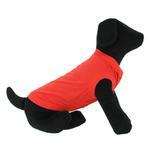 Our Barking Basics!® Dog Tank Shirt in Red is the perfect shirt for almost any pet at an exceptional value! 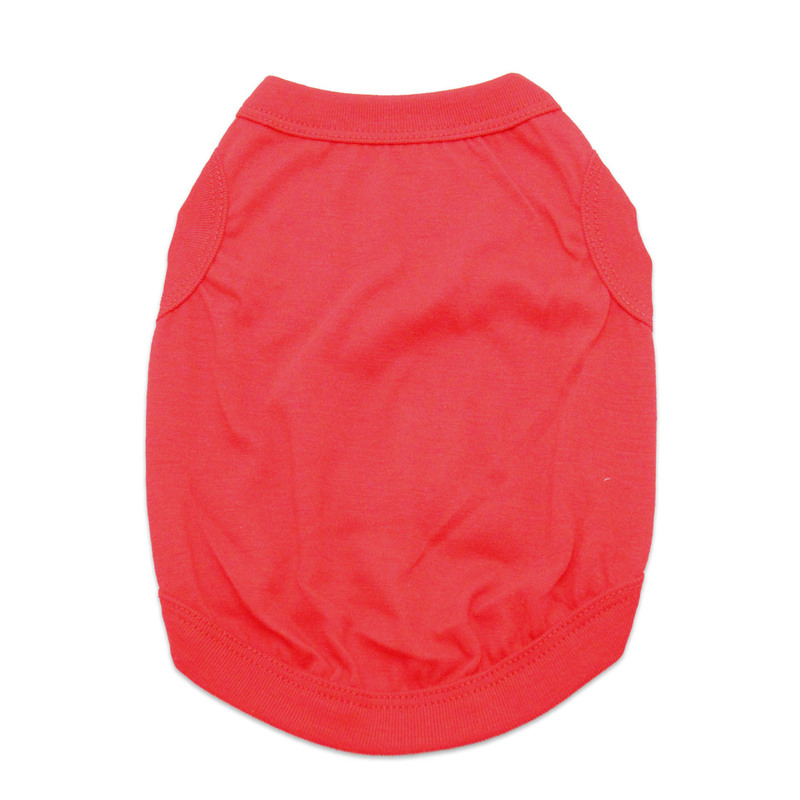 This Barking Basics!® Dog Tank Shirt in Red is sure to be your dog's favorite with a comfortable fit and 100% cotton breathable material. It's great on its own, or use this tank year round by layering it under coats and sweaters to help keep shedding down and for extra warmth. This bright red shirt is a great choice for Christmas, Valentine's Day or any festive event. For even more fun, add iron-on patches, embroidery, or screen printing to commemorate an event or just for cuteness. A great option to customize for sports fans! Have the dog help your event be even more special by designing these tanks for graduation parties, birthdays, family reunions, or gift showers. You could also customize these for a charity or pet event. The sky is the limit! The soft knit dog tank is made of 100% cotton. Machine wash, cold and dry flat for best results. Barking Basics Dog Tank Shirt - Red Customer Photos - Send us your photo! Peyton the Maltese “aka” Pey Pey is sporting his red tank top designed by Barking Basics and sold exclusively at Baxterboo.Com. Peyton loves vanilla ice cream and cozy blankets. Here's Joey being photogenic in his cute red tank top. He seems to be very comfortable in this shirt. The quality and color is perfect! Portland loves his Baxter Tee. He is about 8 pounds and the medium fits him perfectly! With evening setting in and play time over for the day, our soon-to-be 7 year old cairn terrier chihuahua mix is comfy cozy and ready to snuggle in her red Barking Basics tank tee shirt. Bella has this great tank in several colors, and we both love their soft fabric, comfortable style and fit, and versatility. The extra bonus is this tank easily doubles as an easy to wear nightshirt! Baxter Boo, thank you -- you have once again provided a great fashion and function item for Bella to enjoy! Hillary loves to show off her large wardrobe. She loves to show off her beautiful smile too. Here she is showing off the red barking basics tee. Doesn’t she look stunning??? I made this for DeVito in honor of his namesake and this year's Superbowl commercial... he has a sense of humor too !! ?? Ralphie is a pocket pom. I rescued him 3 weeks ago, He is 6 years old, and I am in LOVE with him. Thank you Baxter Boo for the cutiest clothes! She is the sweetest old girl.Staying Cozy in her new Doggie Design tank tops. Roger is an 11 year old, very talkative, orange tabby Siamese mix who was found as a stray when he was about a year old. Due to thyroid issues, which make him chilly, and anxiety problems, he wears shirts a lot of the time. They keep him warm and make him feel safer. He is quite the fashion plate, with an entire trunk full of clothes and fun costumes. The BaxterBoo shirts fit him wonderfully (we have many! ), and this red one is a big favorite. His 1400+ followers on Facebook would agree. Shelby, Sadie, Pegee wearing their red tank shirts for Valentine photo at local pet store. These Things will not bite you, they want to have fun. Then out of the box came Thing Two and Thing One.... and Thing Three?!?! Mini is relaxing in her pretty red shirt! Chiquita is looking pretty in red with her new red tank! She loves it! Chief has shirts on every day due to a lack of hair. He loves the sleeveless shirts for summer. They come in lots of colors which he has, and they are lightweight. Magi insists on wearing her tees on a warm day. They are so light and comfortable. She changes colors frequently. Katie loves her new Red Shirt! Henry loves his Barking Basic Red Tank. Great shirts!! Henry loves his Barking Basic Red Tank. These are so nice we have them in several colors. Henry loves his Barking Basic Red Tank. This is his newest one, he has almost every color. Cute and comfortable. He looks very handsome in red. This red Barking Basics Dog Tank Shirt (size L) has been an ideal alternative to the "cone of shame" for 21lb Jethro, post surgery. Not only does it stop him licking his chest stitches, he looks super cute in it too! Zack weighs about 16 pounds and the medium fits him perfect! Posted On 03/15/19 by Molly C from , Yes, Molly C recommends this product! I ordered this to make a Minnie Mouse costume for Halloween! Costumes are so expensive so I opted to make my own. This shirt worked out perfect! I saved a lot of money going this route! Love these shirts. Well made, comfortable, and cute. Posted On 03/01/18 by Nancy C from Brooklyn, NM Yes, Nancy C recommends this product! Bright color and nicely made shirt ... elastic sewn into the neck, leg and bottom openings . I ordered DeVito an XL and it fits true to the measurements listed for that size . His measurements are : neck -15" , chest - 22" , length - 19 " . I ironed on heat transfer vinyl for a little personalization project and it adhered with no issues. The sizes range a bit, I previously got a medium and it was little tight. I ordered 2 more shirts different colors in large and one was slightly bigger than the other. Posted On 10/22/17 by Patricia D from , CA Yes, Patricia D recommends this product! Love this basic tanks. The price is right, they fit my dog well and they last! These tanks have lasted longer than more expensive pieces. These wash well too! What can I say but that I have these t-shirts in every color. Absolutely love them!!!!??? Posted On 09/23/17 by Sherry S from West Monroe , LA Yes, Sherry S recommends this product! I love these little shirts! They fit great and are great for adding decals and ruffles or whatever! The large fits my 16lb Shih tzu and my 17lb Lhasa apso perfectly! Posted On 09/02/17 by Patty H from Nixa, MO Yes, Patty H recommends this product! I have 3 dogs of different ages, sizes & breeds. I love these tees in chilly weather. The tiny Yorkie sleeps in hers in mild winter as p.j.'s. Great value. Posted On 08/30/17 by Mary M from garnet valley, PA Yes, Mary M recommends this product! I purchased several of the light weight dog tanks. they arrived in no time and I am very pleased with the quality . Looks great on my 4 dogs They look like a very colorful little bundle of well dressed ladies. Thanks. Posted On 08/30/17 by Patty H from Nixa, MO Yes, Patty H recommends this product! With 2 dogs & a new puppy I find these tank tees perfect for several seasons & serve as pajamas for the small Yorkie. Posted On 08/23/17 by Denise N from , NY Yes, Denise N recommends this product! This entire line is the BEST. The red is a true red. The quality is wonderful. Very soft, colors do not run. I hand wash mostly but have machine washed without issue. My girl has put on some lbs, in process of replacing all her tees with bigger size. These tees are MUST HAVES!!! Posted On 08/02/17 by Pam S from olathe, KS Yes, Pam S recommends this product! The website made it very easy to order the item I was looking for and I received it in the mail very quickly.The tank shirt looked very cute on my dachshund puppy. Vibrant red color and size meets chart. Doesn't shrink when washed. Posted On 07/29/17 by Kelly from Waikoloa, HI Yes, Kelly recommends this product! My Brittany spaniel mix suffers from HORRIBLE contact allergies. These shirts are affordable and well made. He wears them everyday and it keeps him from breaking out. We love this product. Posted On 07/25/17 by Jennifer Sobon from greenfield, WI Yes, Jennifer Sobon recommends this product! The shirt needs to be designed better. the underside is way too long for my dog, almost as long as the back. The dog gets the shirt wet when he urinates. Posted On 07/22/17 by Allison L from , NC Yes, Allison L recommends this product! I ordered these to fulfill an order for some custom doggy shirts for a customer. They are great quality and easy to work with. Fast shipping too. Pretty red t-shirt! Fits Mojeaux well! Posted On 05/29/17 by Stephanie from , WA Yes, Stephanie recommends this product! These shirts are a must have for any dog. Fit is great and they are incredibly adorable. Posted On 05/12/17 by Taylor E from , Yes, Taylor E recommends this product! Awesome tanks. Great basic shirt for anytime wear. Posted On 04/08/17 by Debra D from Blairsville, GA Yes, Debra D recommends this product! I ordered four of these shirts in a large for a miniature schnauzer they were way too small and then I ordered the same shirts and an extra large and they were way too big. I don't understand your sizing methods but I wish you would make the large bigger or the extra large smaller so that I could find those shirts for my dog and they would fit. Otherwise they're wonderful shirts the colors are beautiful The Price is Right and I like them and they're comfortable for my dog because of the soft cotton use. The only thing I have to say is the sizing. Posted On 04/07/17 by Traci W from , NE Yes, Traci W recommends this product! This is a light weight tank type style t-shirt. We put our high school mascot on them so our dogs could show school spirit when at school functions. ???? Posted On 03/30/17 by Ann P from , MO Yes, Ann P recommends this product! These are exactly as described. Can't wait to see the dogs in them!! Fast shipping! This T shirt is okay for the basic. Nothing monumental since it's just a plain t shirt. It'd be nice if you want to monogram/applique something on it yourself. I bought this for my baby girl as a lounge shirt around the house. It's a bit long but the chest measurement was on point. I'd consider this definitely a wear around the house t shirt. I will consider buying this shirt in different colors later. Posted On 01/31/17 by Kim R from NRH, TX Yes, Kim R recommends this product! I ordered this tank shirt in several colors for my newly adopted 6-lb terrier mix. I think she looks adorable in these shirts. Because of the quality fabric, they are very comfortable for her to wear. 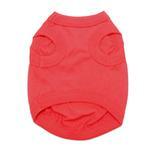 Nicely constructed tank shirt with a beautiful, bright, red color! The shirt wears well and feels so soft! We're using these shirts for Santa Paws and Thing one/Thing two costumes. The are nicely made, came quickly and fit our Rottweilers well! I'm VERY PLEASE with this Baxter boo purchase! Posted On 12/03/16 by michelle m from Riverside, CA Yes, michelle m recommends this product! Great price for a good quality item. Fits great. Seems comfortable on all 3 of my pups. Ordered this primarily for a foster pittie who was severely neglected and has bald patches all over her back. Wanted lightweight material she could wear without getting too hot on a walk. Works perfectly for that and as a bonus she looks super cute and festive too. Make sure to measure according to the chart. I did have to order a larger size than I would have guessed. Posted On 11/29/16 by Elizabeth Ann M from Exchange, WV Yes, Elizabeth Ann M recommends this product! The tee fits fine but the leg holes are way too tight. I will have to modify them, some how. Nice soft shirt for Emma to wear, waiting for Santa. Posted On 11/04/16 by Helen M from Tucson, AZ Yes, Helen M recommends this product! These are great for in-between weather seasons and for walks outside. Nice material! Posted On 11/01/16 by Terri A from Cleburne, TX Yes, Terri A recommends this product! Liked it but I probably should have got a small. She will grow into it. I liked it because no sleeves. She has very short legs. Great Sleeveless Ts for your dog(s)! Posted On 10/29/16 by Cara Tenuta from Arlington, VA Yes, Cara Tenuta recommends this product! Our 4 dogs love these Ts and they good good in them! I love the tank shirt I ordered and received promptly. It is just the right size and weight for a little warmth for my Yorkie that has some fur. Posted On 09/09/16 by HP from LOL, FL Yes, HP recommends this product! Great quality, fits true to size, and adorable on our Miniature Dachshund! This shirt is great quality. The material is soft and light which is great for summertime. Posted On 08/03/16 by Cheryll G from Shenandoah, IA Yes, Cheryll G recommends this product! I buy these little tank tops for my two Chihuahua's. They wash up really nice and if you put them on a low temp dryer they don't shrink. I bought this red tank top in a size xs for my four pound chihuahua and in a size medium for my 12 pound miniature pinscher. I really love these shirts, they're great quality, they fit great, and are such good pieces for their wardrobes! Reccomend 100%! The size X-Small was a perfect fit for my 4 lb 8 oz yorkie Honey Bun. This will go nicely with his little overalls that I ordered for him. Ordered a size Small for my 6lb Chorkie. He has a slim, long body like a Chihuahua and it fits him perfectly. Just added a finishing touch which is a American flag bandana and his patriotic outfit is all set for 4th of July! Love Baxter Boo. This shirt is such a great value. Posted On 06/08/16 by Arleen U from , CA Yes, Arleen U recommends this product! Great little T-shirt for your pooch. It is light weight and fit perfectly. Great product. Posted On 06/04/16 by Carlin D from , LA Yes, Carlin D recommends this product! Great quality, and a perfect shirt for warm weather! Great shirt for Memorial Day! 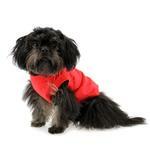 Sachi wore this red pullover for Memorial Day this year. it's bright color shouted "patriotic" and it fit her to a "T". I was proud to purchase such a well-made, high quality shirt. Cooper looks great in red. Love the fit. Great value. Posted On 05/27/16 by Jill S from Beulaville, NC Yes, Jill S recommends this product! We love Prince's colored t-shirts. The size was perfect. Make sure you measure your fur pup and order accordingly. Thus unisex tee is a wonderful shade of tomato red. Buy it before it sells out for the 4th!!! Posted On 05/13/16 by Ruthelisa S from Miami Beach, FL Yes, Ruthelisa S recommends this product! Very comfortable,l I love the material.This is my second purchase for these Tank Shirts, and the most important I founded the sizes for my dogs, for my chihuahua and for my golden retriever. Because always I have problems to buy clothes for my golden retriever because is 2 XXL or 3 XXXL. Now finally they have the same tank shirt and also the same colors. Thank you! Posted On 05/02/16 by Denise N from , NY Yes, Denise N recommends this product! This line provides wonderful light weight tee shirts. They go with everything, are super soft & comfortable too. Posted On 04/27/16 by Judi W from Decatur, IL Yes, Judi W recommends this product! I have the sleeveless shirts in most of the colors for my dog chief. He has very little hair, so they are perfect for summer. They are lightweight, and are wash, and wear, We love the fit of the Baxter Boo clothes. Posted On 04/05/16 by Lizabeth c from , IN Yes, Lizabeth c recommends this product! I am very happy with my Barking Basics Dog Tank Shirt. My poodle Sparkle is so cute in this red color. I plan to order more in different colors. Posted On 03/10/16 by Christine Mountgomery from Warren, OH Yes, Christine Mountgomery recommends this product! Posted On 03/07/16 by Nancy H from Modesto, CA Yes, Nancy H recommends this product! My chi buddy needed a new shirt, so I got him this one. He looks so good in red, and it fits him perfectly! His human mom liked it, too. Best Deal in the House!! Posted On 01/31/16 by Teresa W from Suffolk, VA Yes, Teresa W recommends this product! My Yorky-Poo (Dutchess) LOVES to get dressed up when we go out. But she prefers to lounge around the house in her Barking basic tank shirt. Fits perfect,great price and so many colors and sizes!! Cute - has a good fit. Posted On 01/22/16 by Julie V from Pottstown, PA Yes, Julie V recommends this product! This shirt is great for wearing indoors and out for my dog who gets groomed throughout the winter and needs added warmth. Buy a size up, as they run small. Nice product, fits as expected! I totally loved this red tank - perfect color red (not too bright and not too dark). I ordered two of these tanks - one in XL for our miniature schnauzer and one in a M for our grand-dog who is a multi-pom. They both look adorable in their red tank shirts. They are very soft and apparently comfortable. Neither dog wishes to have us remove their shirts unless we are switching out to another color tank. I have been very happy with the tanks we purchased from BaxterBoo. I have washed and dried the tanks with no problems. The products have held up great with wash and wear. sizes run big but I would buy again. price was very good. Posted On 12/21/15 by val m from Apex, NC Yes, val m recommends this product! The quality was great for the price. I like that it fits longer on top for good coverage. Posted On 12/15/15 by Jennifer S from Morristown, TN Yes, Jennifer S recommends this product! I love these shirts. Henry loves to wear them and they are cute, comfortable, and fit great! Posted On 10/16/15 by Karen Y from , DE Yes, Karen Y recommends this product! Received these TWO days after ordering ! Quick shipping and the tee's fit both my big girls ! I ordered the 3 XL and my one Shepherd weighs 92 plus pounds and my other one 90. Light weight cotton mix(?) material. Hoping they wash well, will hang them to dry. Great for a chill in the air and under their heavy coats and possibly to keep down some shedding ;) Thank you ! Posted On 10/11/15 by KARYLE H from Southside, AL Yes, KARYLE H recommends this product! I finally found an XXS tee for my Maltese, such quality! these tee shirts are just the perfect size for my little Maltese, I could not find an XXS anywhere else. Posted On 10/04/15 by Penne M from Kent, WA Yes, Penne M recommends this product! I ordered this T-shirt in a medium for my 7lbs Yorkie as the measurements stated, it is just a touch too small, I would suggest ordering up 1 size, but it will do for jamies. This red shirt is Exactly what I wanted! I love this shirt. Fits my Golden Retriever perfectly. Its so hard to find things that are big enough. Baxter Boo came through again. Highly recommend and I will be back! Posted On 09/21/15 by Sarah V from Dover, NH Yes, Sarah V recommends this product! Posted On 09/16/15 by Kelly from , VA Yes, Kelly recommends this product! Besides this being at a good sale price, it looks great on Zora. Fits her well and is a good light weight for this summer heat. Posted On 08/22/15 by Jennifer M from Rogers, AR Yes, Jennifer M recommends this product! Love these tees!!! They're the best! And they are great to get personalized/embroidered! fits my long skinny dog perfectly! Posted On 05/25/15 by anne p from , Yes, anne p recommends this product! Can't beat the price for the quality. Luv the tanks. Ready to paint and add a few bows for my little diva dog. Love Love Love these shirts. Nice quality, pretty color, and perfect fit for my dogs. I may have to get some other colors! Posted On 05/23/15 by Miriam R from Plato, MO Yes, Miriam R recommends this product! This is a great little tank and size L fits our doxie boy's 21lb sausage frame really well. The lightweight, soft, stretchy fabric has a comfortable cut and shape that doesn't bother him at all. It's been an ideal alternative to the "cone of shame" post-surgery, keeping his chest stitches covered to prevent him licking. Posted On 05/17/15 by Lyn from Lakeway, TX Yes, Lyn recommends this product! I have bought 4 shirts now and love every single one of them. I have a very small Frenchie who has allergies. When she has a t-shirt on she does not itch??? So I will soon have this t-shirt in every color. Love them, love them, love them. Posted On 04/21/15 by Amy T from New York, NY Yes, Amy T recommends this product! Super cute and nice weight for summer. Posted On 03/11/15 by Miriam R from Plato, MO Yes, Miriam R recommends this product! We bought size L for one of our dachshund boys and it fits his 19lb sausage-shaped frame pretty well, though he did manage to wiggle out of it during a floor rolling session. The quality and styling is great for the price. It was easy to do online sopping. Everything was very clear.